Jewelry polishing cloth: Target, Etsy, et cetera. If it works on silver, it will work here. Dremel + polishing kit. You need brushes, but you don't need a cord. The $70 cordless dremel actually has the brushes, felt wheel, and compound; that extra kit is optional, but you may need the extra brushes and wheels if you do this a lot. Pickling: soak the part in vinegar for a few hours. This will clean off any surface goop and leave the metal ready for further processing. Rinse it when you're done (unless you're proceeding to make verdigris covered in the polishing article). Brushing: I brush a little before pickling just to remove the "big" stuff, then again after if I need to clean up further. 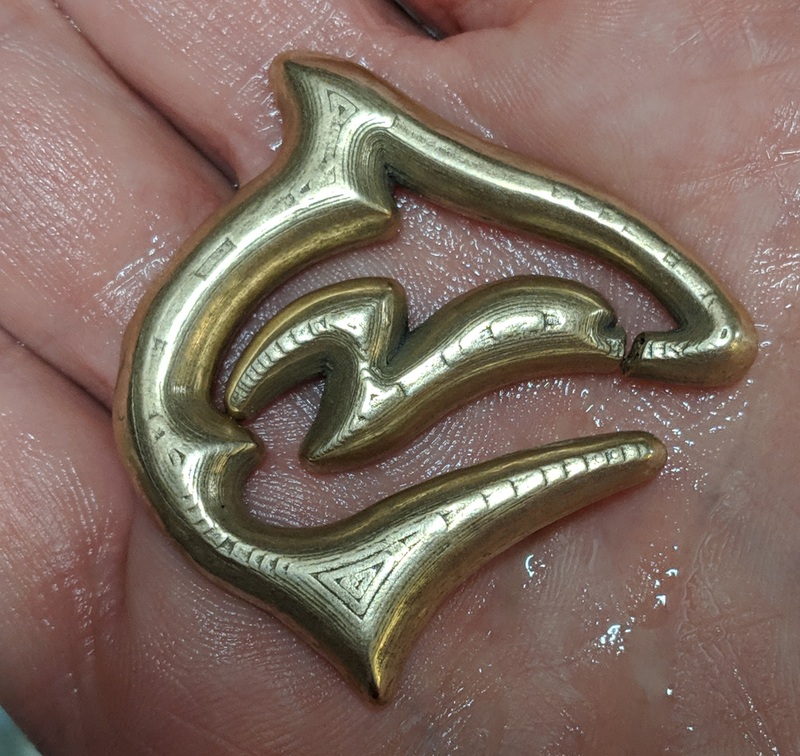 Steel brushes work great: they don't harm the bronze much, but they're hard enough to pull off any really clingy surface layer left over from the refractory. A dremel or your favorite rotary tool, with a wire brush attachment, works great. A handheld brush is OK, but it requires a lot more work and time. I use the dremel a LOT. A well-brushed part almost looks polished; it won't have a lot of "brush marks" seen on a traditional brushed finish. Shaping: 150 grit sandpaper will leave that "brushed" finish. 3M has this new rubbery / flexible stuff, it's great. With some elbow grease this can also take burrs and edges off parts. For faster or more aggressive work, I use a sanding wheel on the dremel. Tumbling: this is the secret. Seriously, if you only buy one tool, buy a $40 rock tumbler. For solid metals I use coarse ceramic media and lemi-shine (or burnishing compound). This rounds off corners and bangs the parts into a pretty awesome polished finish. Left long enough they don't look 3d-printed, so if you want to preserve a little of that layered look, keep an eye on them. Steel pins will brighten up a metal part as well, without reshaping the corners. Re-shaping: After tumbling the surface will be pretty awesome: very smooth and shiney. Hitting it again with sandpaper will add brushmarks, so do this sparingly. A dremel + relatively fine grinding wheel can help provide further shaping without wrecking too much of the tumbled finish. Polishing: the dremel comes with some polishing compound and felt wheels. Mother's and Brasso also work well: you basically want some very light abbrasive, and that felt wheel. Dampen the felt wheel, apply the compound, and go. Run the wheel at a relatively low speed, it will quickly add a shine to a brushed or tumbled part. It's hard to get in the crevices though; tumbling + pins might do well if you really want to shine all surfaces of a complex part. Buffing: rub the part with a jewelry polishing cloth. It will leave a black mark on the cloth, but comes away bright and shiney. This works great at any stage, and has obvious and immediate benefit. Waxing / finishing: solid parts can benefit from a coating of wax. All that cleaning and polishing has exposed very clean material to the air, so a little protection will be needed to keep it from developing a dull surface coat. Minwax furniture wax is easy to find, but any carnauba or beeswax oughta do great. Apply with a damp cloth, let it dry for a bit (hour+), then buff with a dry cloth.